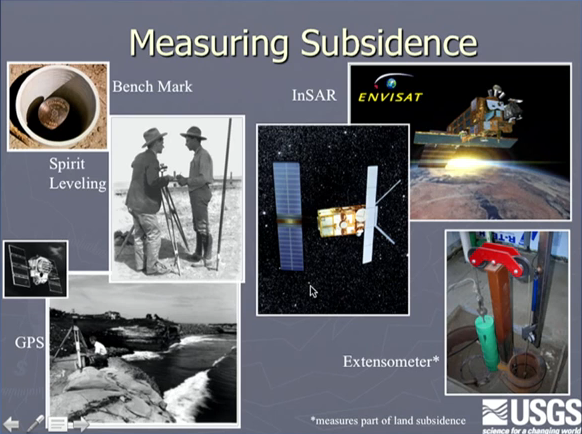 She began with a photo that’s very well known for depicting land subsidence. “This is Joe Poland and he’s using a telephone pole or a power pole to illustrate where the land surface was in 1925, where the sign is, 1955, and where he is standing in 1977. 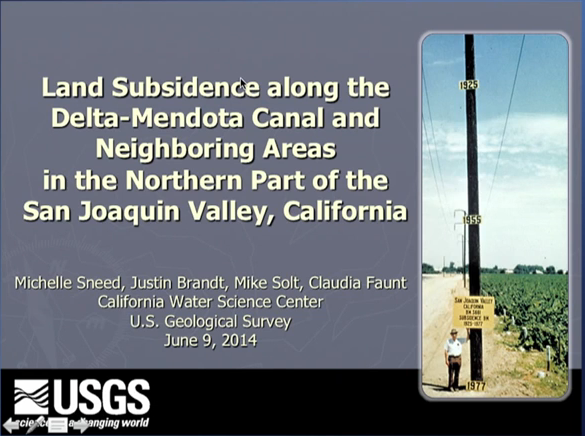 Almost 30 feet of land subsidence has occurred at this location during that time period.” She noted that in the picture, he is standing is southwest of Mendota, but today she would be talking about a different area, a new area where they were surprised to find subsidence occurring. 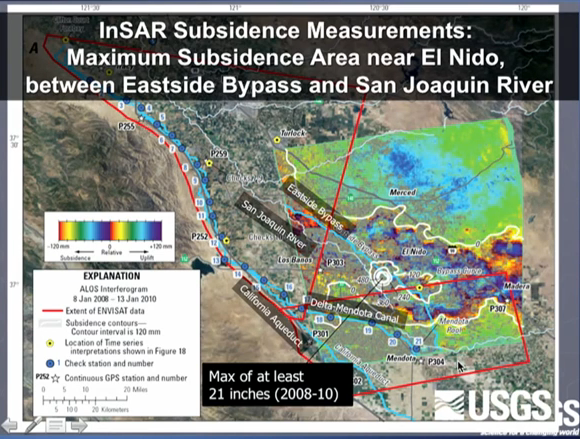 “What we found were 1200 square miles subsided in the northern San Joaquin Valley area in an area bounded by Mendota on the south, Merced on the north, Madera on the east, and Los Banos on the west,” said Ms. Sneed. 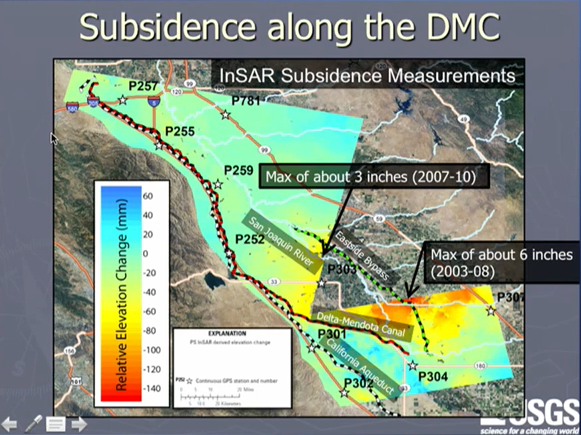 “The subsidence is occurring at rates ranging from about a half inch a year to almost a foot a year over a 2 year period, from 2008 to 2010.” She noted that surveys done since then by Reclamation and DWR indicate that these rates of subsidence have continued through 2013. 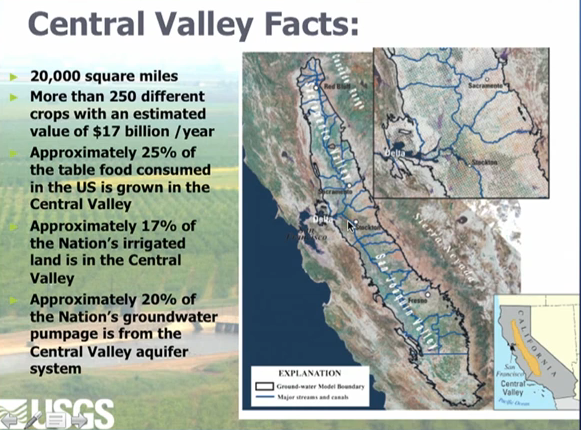 The Central Valley, and the southern half, which is the San Joaquin Valley, is very important to California, she said. 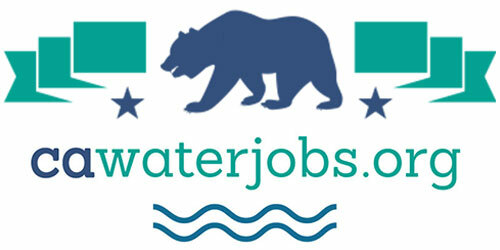 “It’s large; it takes up the center part of our state – about 20,000 square miles or so. About 250 crops are grown here, and they’re worth about $17 billion a year, so it’s very important for California’s economy,” she said. 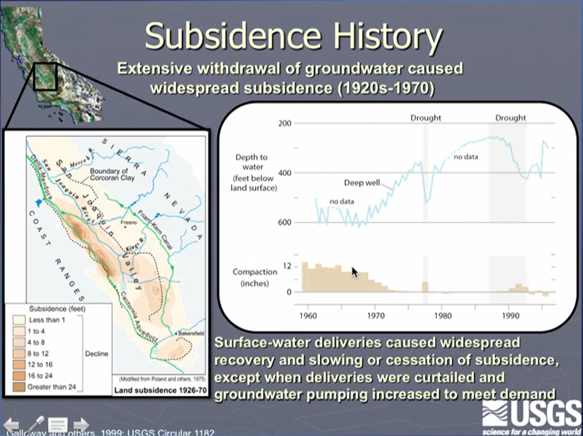 There are many kinds of subsidence, but principally only two kinds in California, said Ms. Sneed. 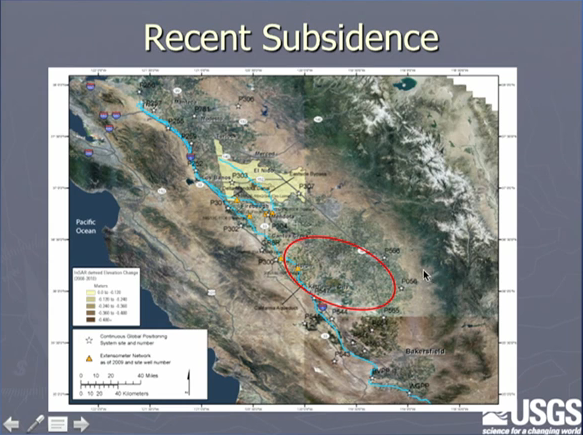 The type of subsidence that occurs in the Delta is a shallow process that is unrelated to the subsidence occurring in the Central Valley, she noted. 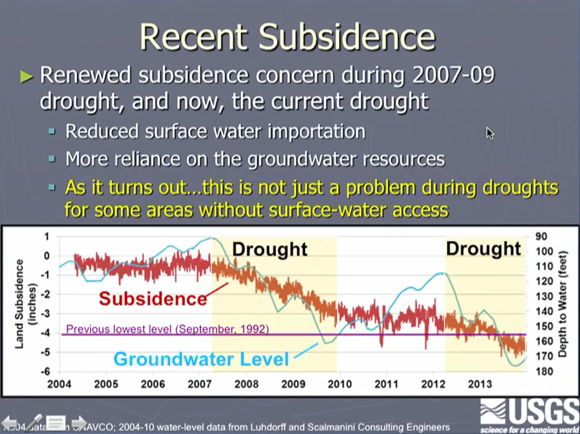 Subsidence reduces freeboard, which is the distance between the water surface and anything that crosses it, such as bridges or roads. 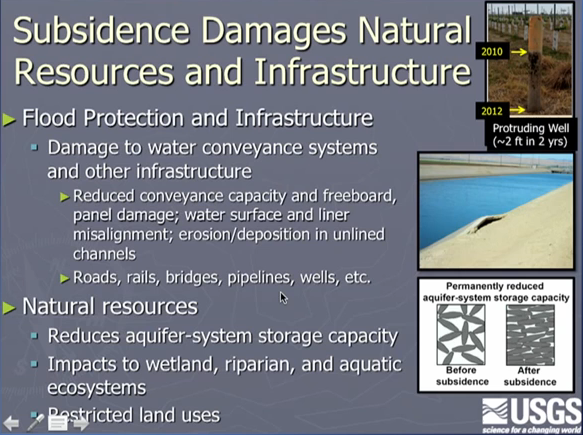 “When you have subsidence, now sometimes the water will be running into the bridge which will damage the bridges integrity, causing erosion and other problems,” she said. “For lined canals, we start to get water coming up over the top of the concrete liner if it’s misaligned, because of subsidence. 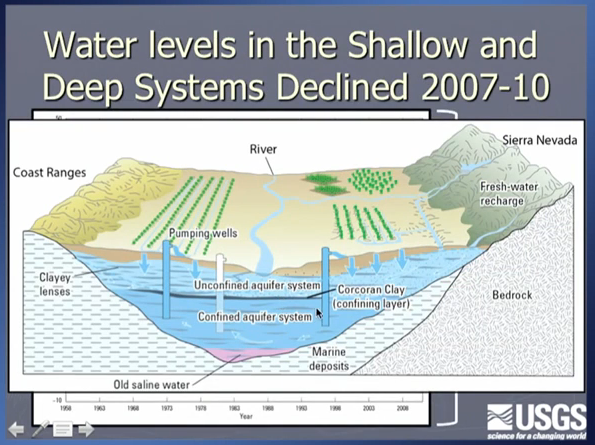 Water will go over the top of the liner and erosion problems will occur subsequent to that.” She noted that with unlined canals, subsidence can cause deposition and erosional problems. 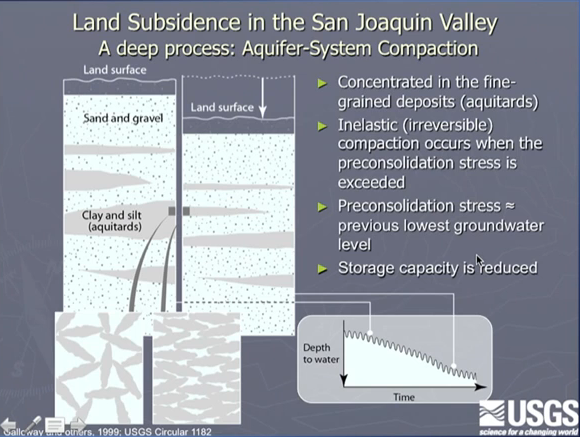 She then presented a photo of a well in the San Joaquin Valley. She explained that when the well was drilled in 2010, the painted the top of it orange so farm equipment wouldn’t hit it. 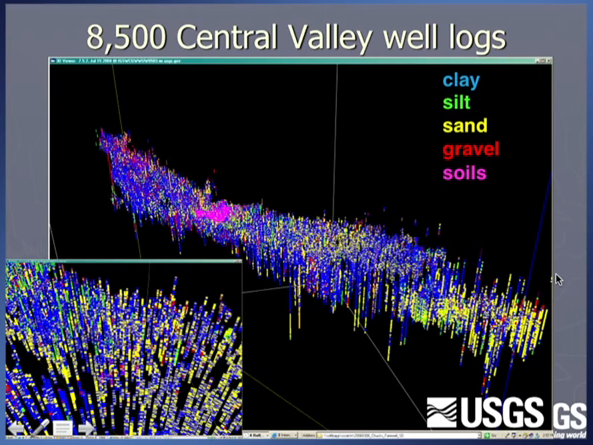 “However, two years later, two additional feet of that well casing were sticking out of a ground, so we’re looking at about a foot a year at this location,” she said. 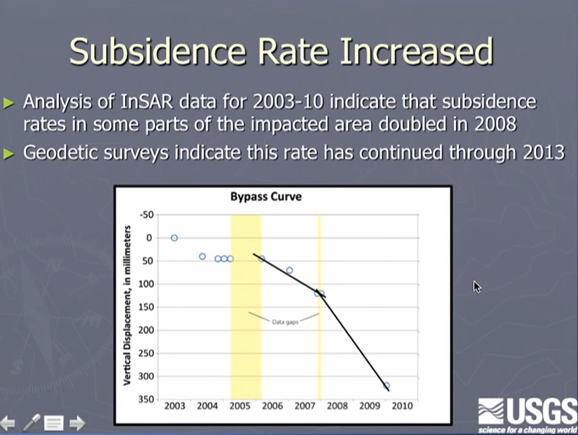 She then presenting a slide of the results from the InSar satellite technique. 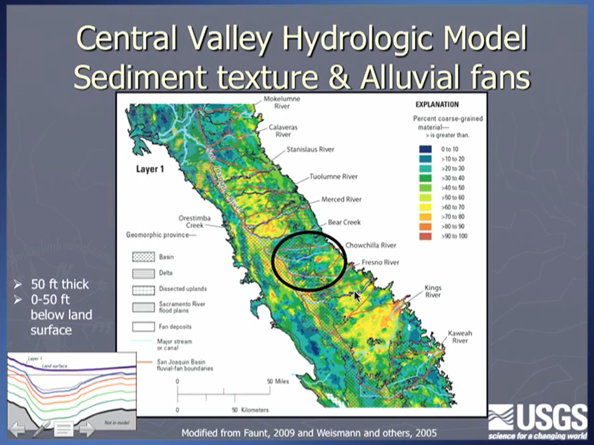 She noted that the focus of the study was on the Delta Mendota Canal which is shown in red on the left. 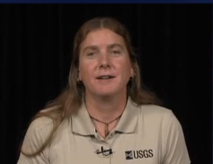 “We had to choose our data to make sure to cover the DMC and be efficient at the same time. We could see that most of the Delta Mendota Canal looks pretty stable – some subsidence a little bit, but relatively stable until you start to get to the lower stretches of this canal, and you can start to see some yellows and greens come in here on the edge … We could see we were on the edge of something, but our focus was the Delta Mendota Canal. She noted that the two images were from slightly different time periods. 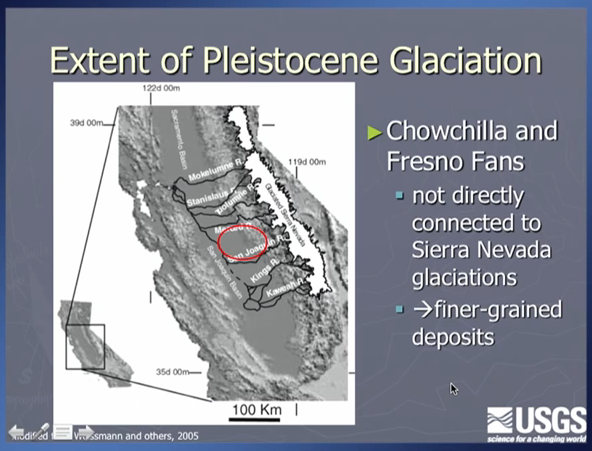 The northern image is from 2007-2010, and results showed about 3” near the Eastside Bypass, which was near the edge of their data and far from the Delta Mendota Canal. 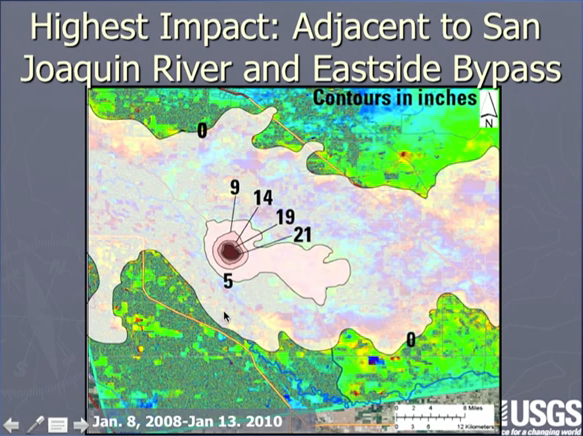 On the southern image, from 2003-2008, there was about 6” during that time near the Eastside Bypass. 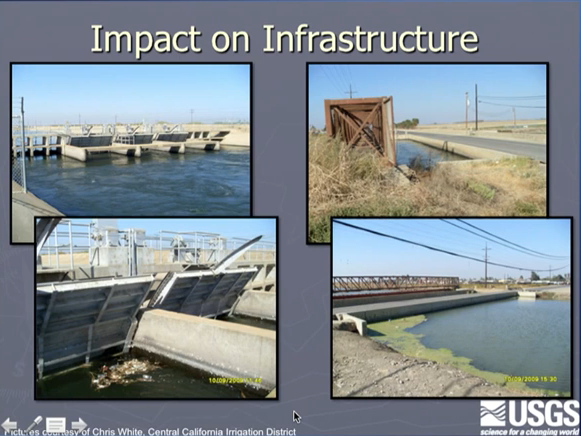 “It looked like we were on the edge of something big, but we had limited resources so we focused on the Delta Mendota Canal for the time being,” she said. 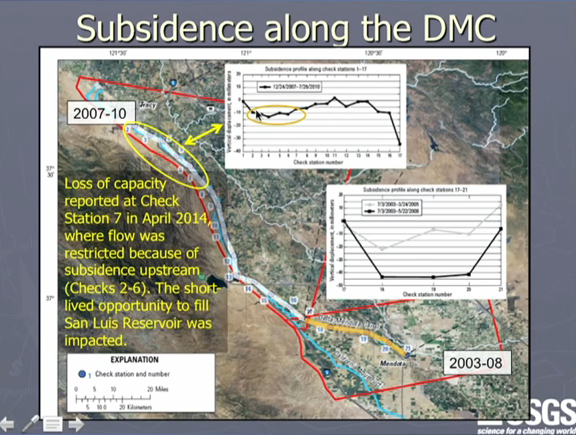 “Here are the results that we found,” she said, presenting a slide with two graphs that depicted subsidence along the Delta Mendota Canal. 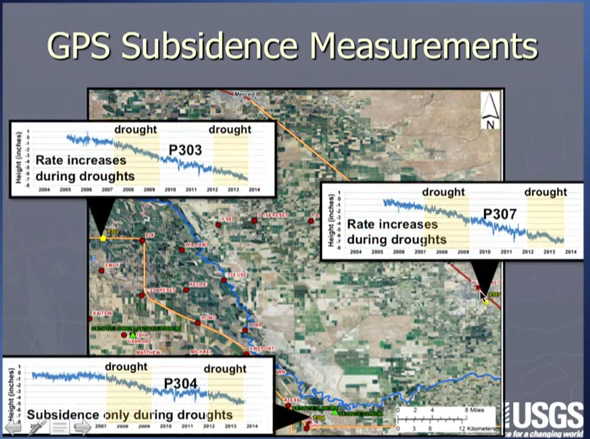 On the x axis is subsidence, and on the y axis are the check stations for the Delta Mendota Canal. The portion circled in yellow on the graph corresponds to the area circled on the map of the Delta Mendota Canal; the upper graph covers check stations 1 through 17, and the lower graph depicts 17 through 21. 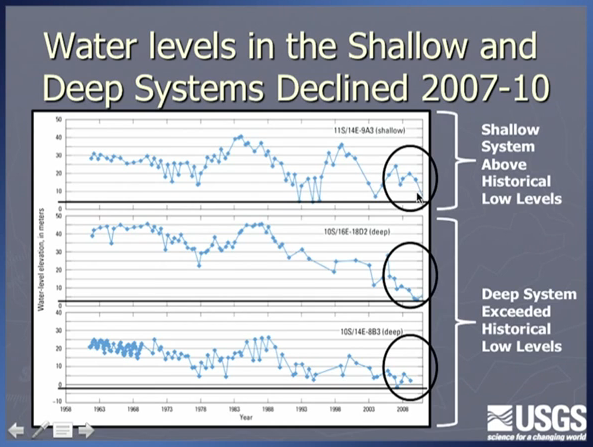 “It looks like check stations 1 through 10 are fairly stable, but what really gets your attention is between check station 16 and 17,” she said, pointing to the end of the upper graph. 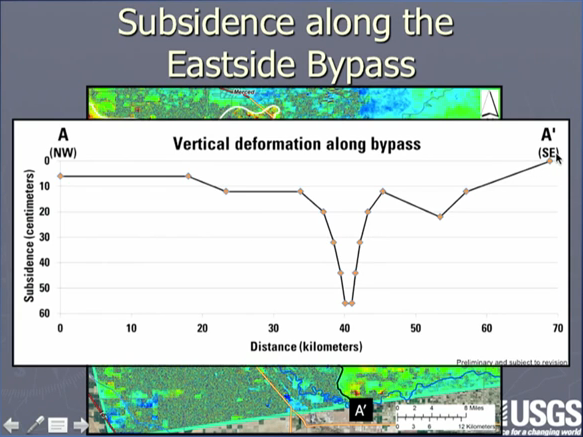 She then presented a close-up of the area between the Eastside Bypass and the San Joaquin River, noting that the Eastside Bypass transects the area of subsidence on the north and the San Joaquin River transects the area on the south. 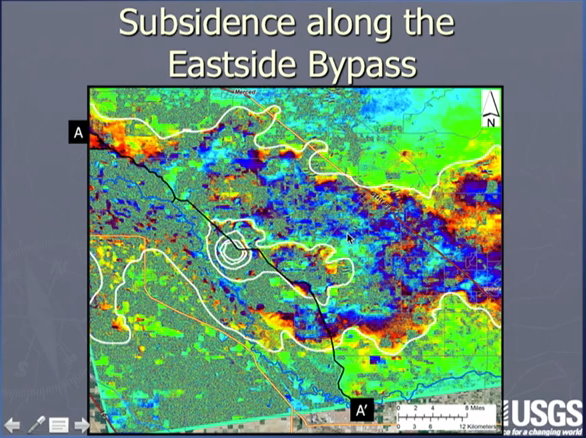 She then presented a map, and noted that the light green indicates the area they are mapping now, which is northeast of the area where subsidence has historically occurred. She also noted that the red circle is an area that they’ve just started looking at in the last couple of weeks. 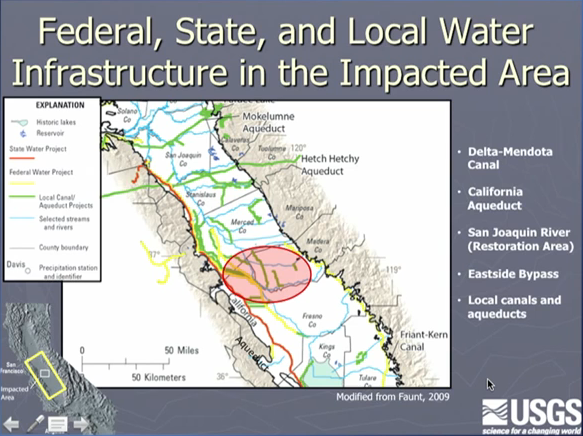 “The Delta Mendota Canal is right between these two areas, so historically it was being impacted that was occurring to the south, and more recently, it’s being impacted by subsidence occurring to the north,” she said. 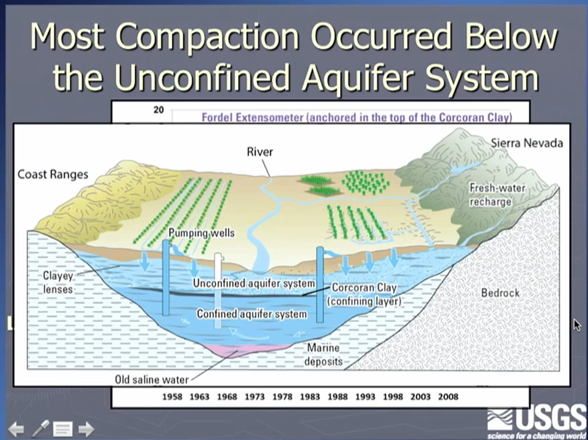 She then presented a graph of a cross-section off the San Joaquin Valley aquifer system noting that there’s an unconfined aquifer system and a confined aquifer system. 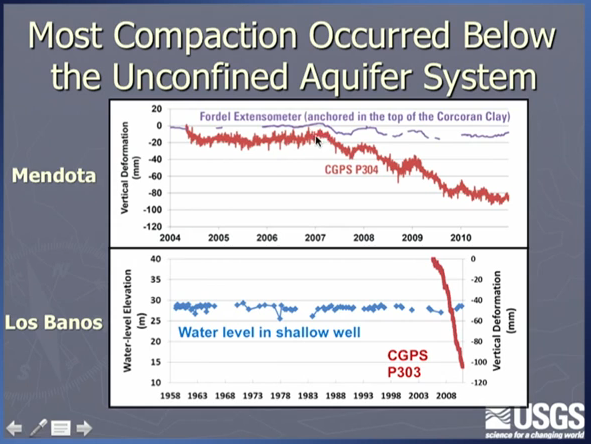 “There’s a Corcoran clay confining layer, a very clay-rich unit that was laid down by an ancient lake, and that confines the aquifer system; it is a pressurized aquifer system, a confined aquifer system,” she said. 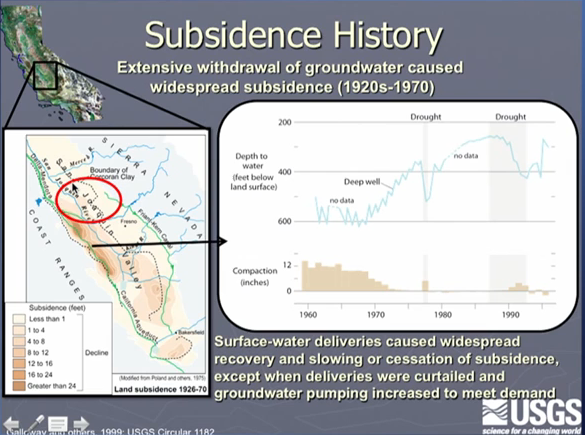 The high rate of subsidence is due to groundwater level declines below historical lows and clay units. 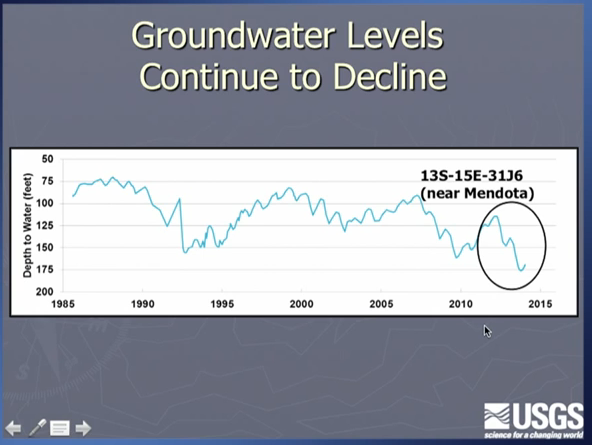 “Groundwater level declines and geology – we need both of those things for subsidence to occur,” she said. “It’s a really interesting area for further research, and we’re looking forward to doing that,” Ms. Sneed concluded. 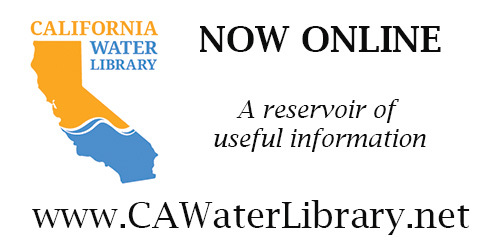 This post is derived from a webinar from the series, Insights: Water & Drought Online Seminar Series, produced by the University of California Agriculture and Natural Resources. To view a list of all available webinars in this series, click here.